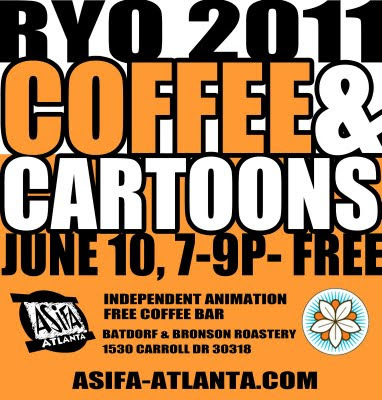 ASIFA-Atlanta is holding our 9th annual independent animation screening. The featured animations will be automatically considered for our International Animation Day DVD, which gets sent to ASIFA chapters all over the world each year. It's FREE to attend, FREE to enjoy the utmost in coffee brewery. What will they draw in your cup? Vote for your favorites, "Best In Show" AWARDED: Adobe prize pack including CS5 for Mac, Premiere, and Photoshop Elements!